Recently, we looked at a new report showing machines used to perform musculoskeletal ultrasound (MSUS) vary considerably in ability to detect inflammation, and warning about the use of MSUS in treatment decisions when the machines are not yet accuracy rated. We know that Patient reported outcome measures (PROMs) predict prognosis in Rheumatoid Disease (RD), but they are seldom used. So how do rheumatologists make decisions about treating RD? Today, we’ll crack open the door to the thinking process that dominates some of them. At the close of the ACR meeting last month, four RPF volunteers attended a medical symposium hosted by Medscape / @MedscapeRheum (not an official program of the American College of Rheumatology). The topic of the CME seminar was “Guided by Objective Measures: Challenging Case Scenarios in RA.” Several industry folks also attended, as observers – like us, but most attendees were rheumatologists. Cases (patients) were described during a presentation from the stage, and then discussed in smaller breakout sessions. We were placed in a group that included a couple of industry representatives and about 20 doctors. Most of what we observed, I’d heard before, either from readers or directly from rheumatologists. But I was glad that the other volunteers could hear first-hand the attitudes of several doctors in a discussion where they earned educational credit. It’s difficult to summarize 2 hours, but here are some key observations. 1) Four European doctors (from Sweden, I think) seated next to us had a modern treatment approach that included measuring – PROMs and MSUS. Their philosophy seemed to be to get the disease under control as soon as possible, and not allow symptoms to continue to exacerbate. Our facilitator seemed to discount their opinions or restate them to suit his own. Eventually they stopped contributing and talked quietly among themselves. 2) The facilitator didn’t conceal his confidence that doctors always know better than patients. He didn’t say it, but it was almost as if PROMs are a necessary evil that don’t hold much weight. Repeatedly, he led the group to the conclusion that a discrepancy between a doctor’s and a patient’s assessment is resolved by explaining away the patient’s assessment: the patient needs to understand that her disease activity score is a result of something other than the RA (such as bursitis, anemia, or cardiovascular issues). 3) Other opinions were similar to that of our facilitator, and they were reinforced during the seminar. One said he measures patients with a RAPID-3 and a joint count; when the facilitator said, “Wow,” the doctor admitted, “Well, I do that in my head to save time… I’ve been doing this a long time so I can tell…” He had answered the iPad poll that he uses those methods, but in reality, he was still using Gestalt (his subjective opinion). Another doctor was frustrated about patients not agreeing with his assessments and wanted to find ways to convince them that he was right. To him PROMs create more conflict because he believes high scores are a result of confounding issues (that he didn’t see as part of the RD). There are over 25,500 comments on this site. The examples below are a small fraction of what could be shown. Many patients of course many have well informed doctors, and hopefully that number will increase. If some doctors are trained in these attitudes, what does that mean to patients? 2) The concept of Rheumatoid Arthritis as a type of arthritis causes harm, because systemic disease is dismissed as “comorbidity” when it is recognized at all. To improve care and outcomes, we must refrain from calling RD “a type of arthritis” and acknowledge systemic disease in the same ways it is acknowledged for other diseases such as Lupus and Type 1 diabetes. 1) Try to find doctors who are trained to use ultrasound and measure disease activity with patient reported outcome measures (questionnaires), and who support shared decision-making. 2) Go to whatever type of specialist is necessary to get adequate care or treatment. 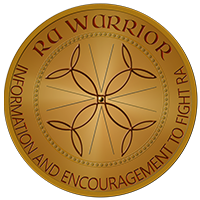 3) Support the work of the Rheumatoid Patient Foundation. Note: pie chart is an excerpt from a larger survey of patient experiences, in part reported here. Thanks for bringing this information from the symposium to our awareness, Kelly. I LOVE that the rheumatologists from Sweden “get-it” and are using both patient reported outcome measures (PROMs) and musculoskeletal ultrasound (MSUS). The culture of any group takes time to change. It is very encouraging that there are members of the rheumatology community who understand the importance of BOTH objective clinical evidence (serology when it is helpful AND advanced imaging) as well as more global measures that BOTH the rheumatologist and person with RD completes. I’m not surprised these doctors were from Sweden. I’m curious what the goal of the presentation by Medscape was? Were they selling a particular product or promoting a particular viewpoint? You mentioned the session was on objectives measures for cases that are challenging. I will continue to reiterate that in the 21st century it SHOULD BE a medical embarrassment when rheumatologists rely entirely on outdated and antiquated procedures such as pushing around on joints to see if there is swelling. That’s like an ER doctor only pushing around on a foot when the person comes in complaining that it is broken. IT IS JUST WRONG !!!!! 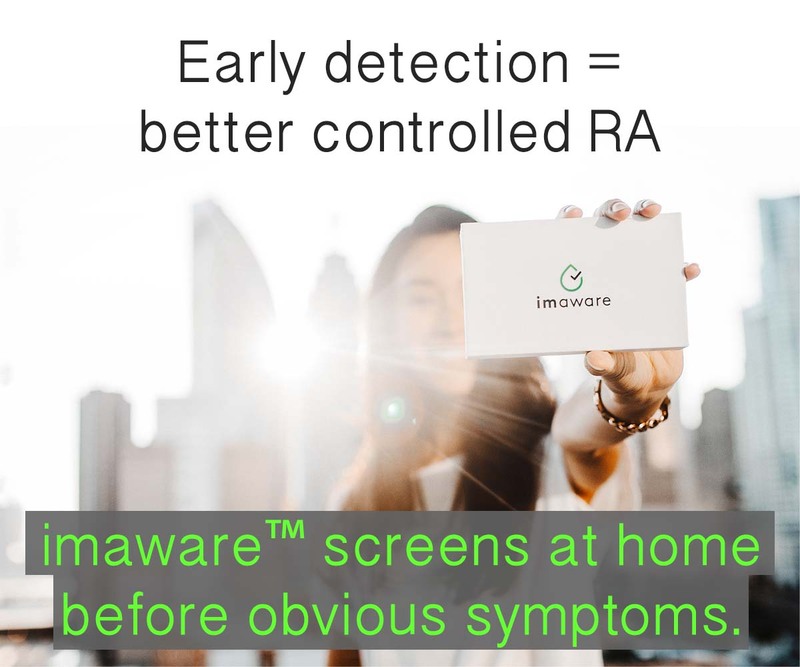 We have the technology and the tools to do an adequate job diagnosing and treating RA. It is the willingness of the medical community as well as patient advocacy for change – that will make the difference. We cannot tolerate these sub-standard medical practices. I like your section on “What can we do”? 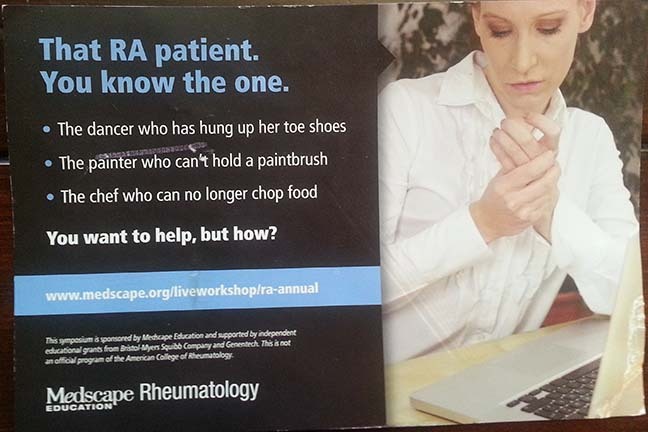 I’ll look forward to hearing about the initiatives of the RPF that will target improved “standard of care” in rheumatology – standards published by the American College of Rheumatology. I also agree with the need to target medical training of new and current rheumatologists. As mentioned, Europe is far ahead of North America in rheumatology care for those with RD. I think a couple of the others who attended will be blogging about it also. The name of it was “challenging cases,” but one of the other patients present commented that they didn’t seem challenging really – pretty typical. I thought so too. As far I could tell, the goal was the CME credit with a nice lunch, something common at medical meetings. I did include the link to the original page for the event. Just trying to share the experiences we had with others in our community. Kelly, I assume this post is meant as a companion piece to your post on PCORI from a few days ago. Is patient input welcomed? Not so much. I wonder how many people who attend these meetings go for the week off, the continuing ed credits, socialization with peers, networking, and the hotel pool and bar. Huge conventions are better for back-slapping and self-congratulation than for challenging the field’s status quo. Having patients there is messy and inconvenient. They don’t share the week-off collegiality. They may be trying to learn more, to challenge authority, or God forbid, to point out where the field has failed them. It sounds as though unorthodox doctors- your Swedes in this situation- are pretty quickly shut down. In my <two-year journey into the world of needing a rheumatologist, I have had three. The first and third, no problem. I'm sure the second one was right at home at the ACR conference. He may have been the facilitator of this session- sounds familiar! What scares me is that he is head of the rheumatology department at a medical school, and is widely published. What you saw epitomizes the training our doctors are getting in school, and the continuing ed available to them. No wonder it takes a few tries to get a good doctor. Conferences of this size and nature are not where doctors are going to learn much. They learn on the job, if their hearts and minds are open. Without the intestinal fortitude to challenge the assumptions their teachers begin from, they don't have a chance. The conference gives them a chance to vent about their stupid, uncooperative patients who don't get better when told to and who don't even know whether or not they hurt, not to learn how to better serve these same patients. The fact that your rheum #2 is the head of a medical school department is exactly what this is about – we are seeing why change is so long & difficult. Interesting that you connect this piece to the PCORI one – I hadn’t thought that – only with trying to share what we’ve observed & help rheum patients begin to see why their doctors are the way they are ..so that we can help to improve this culture where possible. I did participate in the PCORI grant review panel again. They have some wrinkles to iron out, but I think they are trying. The ACR is much more complicated. There are thousands of individuals, and there is the organization / corporate. We are working well with several wonderful members, and glad for those relationships. But progress of a large org. is slow, and there will be more to say about all this in the future. I was worried that this post might just lead to further focus on how and why doctors are so wrong. I get that rheumatology has a long way to go. Please don’t bash the ACR conference or other rheumatology conferences. The opportunity for doctors who devote their lives to clinical practice – to go to a conference to learn about the latest research and the latest techniques is INVALUABLE. Conferences like these are the hub of moving professions forward. Doctors very rarely have the time to read the latest research or to connect with their peers. MOST doctors will eagerly attend these sessions to learn all they can. As in any profession, there is a minority who take advantage of the situation and learn very little. They’re interested in shopping, seeing the sights, and engaging as little as possible professionally. I did read the summary of this ACR session after posting. It sounds like the intent of the session was to provide small group discussion led by more seasoned rheumatologists to discuss challenging cases. There was info in your link about the importance of treat-to-target and the ACR guidelines. The value in these types of sessions is that professionals who are leaders in their field have the opportunity to mentor the attendees. It is sad that the moderator is clinging to the old concept of the doctor needing to convince patients how wrong they are if the doctor has a different perspective than the patient. My guess and hope is that the rheumatologists who were leading small group discussions had a different vision – one that respects patients and respects the need for collaboration between patient perspective and doctor perspective. It is so interesting to me that Rheumatologists don’t listen their patients. Their patients are the reason they have a career at all. I had a rheumatologist like that. He treated and evaluated patients by a swollen joint count and basic scale. He treated me for RA for 5.5 years. Come to find out, I had an Ependymoma tumor inside my spinal cord in my neck (C6, C7, T1) that had been causing my symptoms for years. It wasn’t until the tumor had cut off the nerves to my hands and arms so much that I ended up with severe muscle atrophy in my hands, that other doctors took me seriously and began testing which finally found the tumor. I will admit that this type of tumor is very rare. The Mayo Clinic states that there are only 300 of them diagnosed in the USA each year, but it was not until I had VISIBAL EVEDENCE, that I was taken seriously by doctors. Doctors don’t believe patients if the symptoms aren’t right in front of their faces to see. Very sad. Very wrong, but true. That is why Rheumatoid Disease is so difficult for patients. The doctors cannot see the pain, swelling, inflammation, etc. To bad we can’t all be treated by Swedish doctors, who get it! GREAT article, GREAT comments. This website continues to get more sophisticated with time, exceeding all expectations by most doctors and patients and in betweens. By harnessing the power of numbers of such a refined audience, it will be possible to bring about necessary change much, much sooner than it would have otherwise. Congrats Kelly! Are you kidding me? Are you just arrogant or are you completely ignorant of the physical complaints that I might have. I trained to be a massage therapist, can’t do it. I used to sing at church, the strain on my voice causes me to not have a voice for days. Some times as many as three or four. Just because I don’t have the numbeer of years of education in your field, doesn’t mean that I am ignorant of my disease or that what I have to say about my symptoms or my body should be discounted. Why don’t the doctors listen or care! I’m so frustrated I want to give up and stop going! They don’t seem to inform themselves on the latest findings. I feel like a complete idiot because of my Rheumy. My insurance doesn’t seem to give me many choices of where to go. There is 1 only near me and the others are down a mountain pass. I’m not allowed to go to the one near me, just as well because I have not heard good things about him! I have been lucky. I have had several wonderful rheumatologists. I had one who patronized me and clearly thought I was exaggerating my symptoms; I never went back to him. If you’re lucky to be in a large enough community where there are choices (and insurance allows! ), I highly recommend searching until you find someone you trust. I actually think a seasoned rheumatologist who takes a good history and listens to the whole story as told by the patient may not need as many advanced tests. Of course more data can help, but even with advanced testing, it needs to be in the hands of someone who knows how to listen and and to believe what the patient tells them. As far as conferences: after years of attending medical conferences as a nurse, I can say with confidence that most who go to national conferences are going to learn, to network, to share info, to present their research, to get the latest research results. The meals sponsored by drug and device companies are a different thing, with the meal sometimes being the prime event. patient voice out there; I believe that this will lead to much greater understanding between patients and their nurses and physicians. Last time I was at my rheumy’s office, he told me this story about how someone dropped out of some high up rheumatologist symposium, and he got to go instead. So here he is, a regular rheumy, with the top 10 specialists in some specific area. He told me how these guys (all men apparently) were going on about some medication, and he was saying, in his PRACTICAL experience, that the med was actually, on average, bad for patients. The specialists were all dismissive and said “who cares if the patients have horrible side effects, like anaphylactic shock, you just have to make the take the meds”. My rheumy said he couldn’t BELIEVE what a-holes these guys were with regard to real patients. thanks for sharing, M. There is certainly a mix of doctors, like any other profession. Your doc reminds me of the doc at ACR who commented on the MSUS poster; I’d just mentioned it in passing in the recent ultrasound post here. I’m interested to know if your doc ever made any progress with his peers or whether he attended another such meeting. He’s the kind of guy we need to swim upstream alongside us. 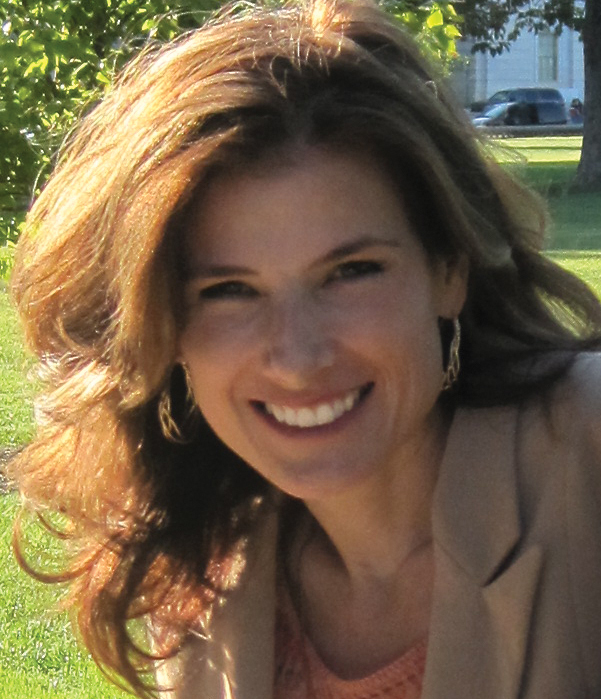 Kelly, my doc is known for listening to his patients, and letting patients make their own informed choices. He participates in research, goes to conferences, seems to know everyone. I’m assuming just by his straight talk he is a great advocate for those with rheumatological conditions. His college age son has severe Crohn’s disease, and I think that really shapes his views. I was having a rather good day (all things considered) and then I read your post. Way to ruin my day, Kelly, LOL. I am currently seeing a widely-loved and respected rheumatologist at a hospital that has a highly ranked (if you find US News rankings to be credible, which is a discussion for another day) rheumatology department. This doctor has a top-shelf pedigree and is still on the young side, so presumably not too rigid in their thinking. The doctor is very much a nice person. The doctor is very much a smart person. The doctor does seem to want to help me. So why is it every time I leave an appointment with my rheumatologist I am feeling like a total fraud? I find the only way to maintain my credibility with my doctor is to lie and say the only symptoms I am experiencing are articular. By the way, someone I know was diagnosed with RA by U.S. physicians and did not respond to methotrexate and other potent drugs. By sheer “luck,” he fell ill while in Sweden and was treated at Karolinska. He is now symptom-free, because the doctors there thought out of the box and realized that he actually didn’t have RA, but an infection deep in his body that was causing his immune system to go haywire. Several rounds of antibiotics later, he is infection-free and doing very well, two years after his hospitalization at Karolinska. I am starting to wonder if I need to start budgeting for a future trip to Stockholm. Wow, Gwyn, your second paragraph sounds like me exactly. My last appointment made me feel that way. My right thumb won’t bend anymore, the joints in my hands, fingers and wrists are hurting constantly. My Rhuemy says ” well it could be the disease, but not sure” me “well can we look to see the damage or something?” Her, “well, no, if it keeps bothering you we can do prednisone or maybe ask your PC” My thumbs have been really bad for 3 months, I wonder when she’ll think it’s bothering me. And the sores on my face couldn’t be related, I get tired of it all. I’m sorry you are in the same boat as me. This is not one of those times where I’m glad I’m in good company — I really wish there weren’t so many of us going through the same thing. I honestly don’t know how you can even sit through these things with those awful doctors. I swear I would want to jump up and down and scream! You must have amazing self control! Wish I had known about the symposium – I would have registered to attend! I have a great rheum doc, but – can’t get on Remicade (co-pay is too high) and that’s the ONLY biologic that Medicare covers. I’m on MTX – have 1-2 days a week when I’m bed/recliner-ridden because of it. Plaquenil hasn’t given me side effects, as yet. I’m on super-high doses of Folic Acid plus Leucovorin 12 hours after MTX. I start getting nauseated BEFORE I inject the MTX – totally psychological. But my rheum doc sings to me as he investigates my hands, my elbows, shoulders, neck, hips, knees, ankles and feet – he even strips off my socks for me and puts them back on himself! The only path open at this point is increasing the MTX dose. YUCK! But at least my rheum doc doesn’t belittle me or think I’m lying about my swelling and pain! Part of moving forward is highlighting the good ones & what they do for patients! And you reminded me of my first rheum doc Dr KBC – so kind to me, also taking on & off my shoes etc. Treating me with respect. Unfortunately, did not know very much by his/her own admission. I have Kaiser Insurance. I had to go outside to get diagnosed for my spinal stenosis and RA. When it came time to get on a biologic, I had to to back to Kaiser for the medications. In fourteen months I am on my third biologic. My last appointment was a shocking eye-opener. I had my shoes off when the doc came in. I showed her the new bones popping out at my thumbs. She told me it was OA. I had an X-ray a year ago. She told me my feet where the same problem, OA. I have not been able to walk very much for a year, her response was that I am on my feet all day at work. No, I am sitting down, I do get up to go to the restroom, that’s about it. After this conversation she did agree that the second biologic maybe wasn’t working as well as she would have liked. She then added that she has been treating to my reported symptoms even though I was a low risk patient for deformities! After all, I am RF negative and all my lab tests look great! After that I was speechless. I think it is going to be difficult to get another Ruemy, but I will have to figure out how this is done.